In 1758 a small sickly baby boy was born, son of the Rector of Burnham Thorpe in Norfolk. No one could have envisaged that this child would, in his lifetime, become one of England’s greatest heroes. Sent to sea aged 12, he soon found that although he loved the ships and the sea, he would suffer from terrible seasickness all his life. Nelson was a small man, just 5ft 4in tall, of slight build and with a weak constitution. He was frequently very ill with recurrent bouts of malaria and dysentery, relics of his time in the tropics, Madras, Calcutta and Ceylon. In 1780 he was again very ill, this time with scurvy and his life, and the lives of his shipboard companions, hung in the balance. But once again this small, apparently frail man survived! In spite of his frail health, in 1784 he was given the command of the Boreas and was on duty in the West Indies when he met and married Frances Nisbet, a widow. After an idle period at home in Norfolk, he was recalled and given the command of the Agamemnon in 1793. From 1793 until his death at the Battle of Trafalgar in 1805 he was involved in battle after battle. He suffered serious injury during these years, losing the sight in his right eye at the Battle of Calvi in Corsica and his right arm at Santa Cruz in Tenerife. Nelson was a brilliant tactician and was often able to surprise his enemies by audacious tactics. At the Battle of the Nile in 1798 his daring and courage completely outwitted the French when he sailed his ships between the shore and the French Fleet. The French guns that faced the shore were not ready for action, as it was believed that Nelson could not possibly attack from that position! Nelson was created Baron Nelson of the Nile by a grateful country after this stunning victory. While Nelson was in Naples in 1793 he met the lady who was to become the great love of his life, Emma, Lady Hamilton. She was a great beauty with a voluptuous figure and a rather ‘shady’ past. Eventually in 1801 Nelson abandoned his wife and lived with his ‘dearest Emma’. A daughter was born in 1801 and christened Horatia, a child whom Nelson doted on, though she was never aware who her mother was. 1801 was also the year in which Nelson destroyed the Danish Navy at the Battle of Copenhagen. During the battle he was sent a signal to break off action by the Admiral Sir Hyde Parker. Nelson reputedly put his telescope to his blind eye and said to his Flag Lieutenant, “You know Foley I have only one eye. I have a right to be blind sometimes. I really do not see the signal”. Nelson had great courage and was a brave man as he endured intense pain when his arm was amputated without an anaesthetic. The surgeon wrote in his diary, “Nelson bore the pain without complaint, but was given opium afterwards”. After the operation Nelson suggested that the surgeon should heat his knives first, as the cold knives were more painful! War broke out again with France in 180, and Nelson was for many months on watch in the Mediterranean. On October 20th 1805, the French and Spanish fleets put to sea and off the southern coast of Spain the Battle of Trafalgar took place. This was to be Nelson’s last and most famous victory. Before the battle, Nelson sent his famous signal to the Fleet, “England expects that every man will do his duty”. It was at the height of the battle that Nelson was shot as he paced the deck of his ship Victory. 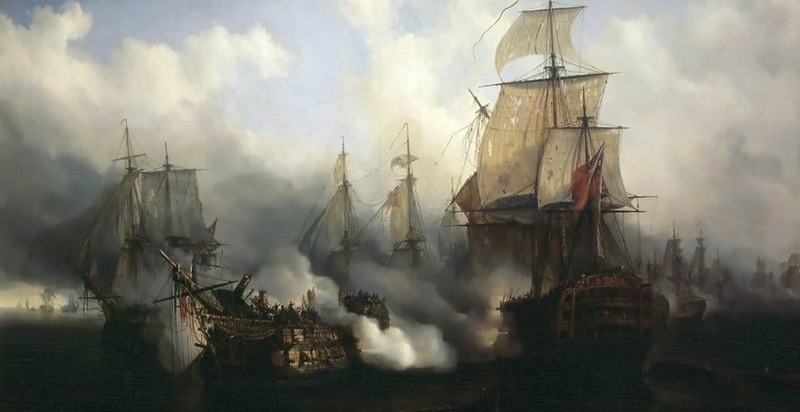 He was easily recognisable by the marksmen on the French ships as he was wearing his full dress uniform and all his medals, and seemed impervious to the danger he was in. He died shortly after he was taken below decks and his body was taken ashore at Rosia Bay in Gibraltar. His body was sent back to England in a barrel full of brandy which acted as a preservative during the long journey home. The injured from the battle were cared for and those who did not survive were buried in the Trafalgar Cemetery, Gibraltar; their graves remain carefully tended to this day. Nelson’s funeral in London was a tremendous occasion, the streets lined with weeping people. The funeral procession was so long that the Scots Greys who led the procession reached the doors of St. Paul’s Cathedral before the mourners at the rear had left the Admiralty. He was buried in the crypt of St. Paul’s. In London’s Trafalgar Square can be seen the country’s memorial to the most inspiring leader the British Navy has ever had. Nelson’s column, erected in 1840, stands 170ft high and is crowned with a statue of Nelson on the top. Lord Nelson’s great love was Emma, a lady with a quite remarkable past!